We are back home and missing those two little ones! We had a good time. Hubby helped SIL get the window in and then wired 8 lights out on their deck and got to go to 20 or more garage sales! We both found some treasures as did our daughter. Our grandson enjoys going to all the sales though he didn't get much and the granddaughter managed to take about an hour nap in the car so it went pretty well! Before I left this pretty block arrived from raesha. 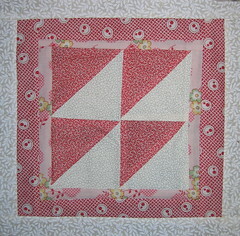 It is for the June Quilt Block Exchange. I need to get busy on my July blocks! This month I will be making 6! Yesterday I got this top together. 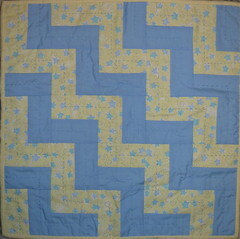 It is made from 120 spool blocks that were made by myself and 5 others. It will go to a charity but so far we haven't decided which one. This is the extent of handwork I got done while I was away. 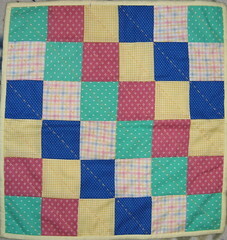 These two little quilts will be for the bazaar in the fall. This one is made from blocks that someone gave me. I just trimmed them all to the same size and put them together. This one started as 4 strips of squares. I just had to do a little ripping and resewing to get them in the right order for this pattern. Like the other two I made recently these are just backed with flannel and have no batting so they will be better for use as doll blankets. 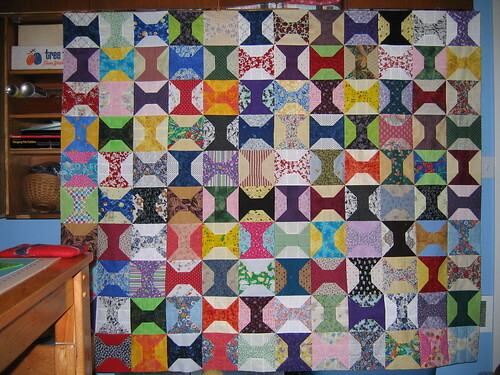 Last night I finished the cutting for the twin quilt I am making that is similar to this quilt. The twin will have red stars and the stripes will be green and white. Today I need to take the car to the dealer to get a part replaced and I need to pick raspberries. After that I hope to get some sewing done!